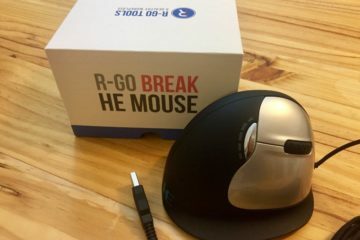 Recently I was given the opportunity to test some amazing products sent to me by R-Go Tools, a Dutch company that specializes in ergonomic office products: ergonomic mice, keyboards, and monitor arms just to name a few. 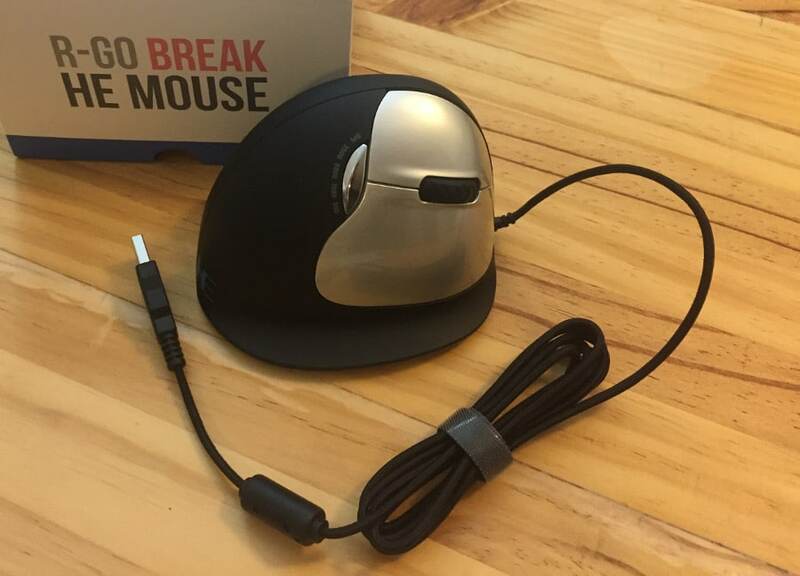 I’ve been using one of their main products, the HE Break Vertical Mouse, to put it through a test and analysis to see how this ergonomic mouse performs. As a vertical mouse, it already has a far more beneficial and ergonomic shape than your standard mouse – so let’s dig a bit deeper and see what other benefits this mouse could bring you. 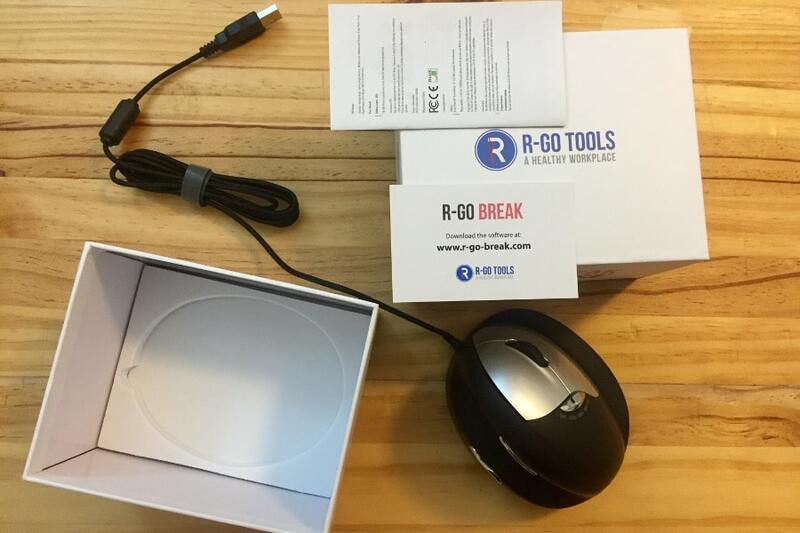 Take a quick look at the video by R-Go Tools which gives a quick overview of the product I will be testing. As I explain in my short bio, I have suffered from many different injuries, which actually led me to develop this website Painless Movement, in the hope of finding new products that could help me live injury and pain-free. One of these injuries was a wrist injury that resulted in surgery, and unfortunately, I still struggle with some on-going discomfort in this wrist – especially after a long day at the computer. 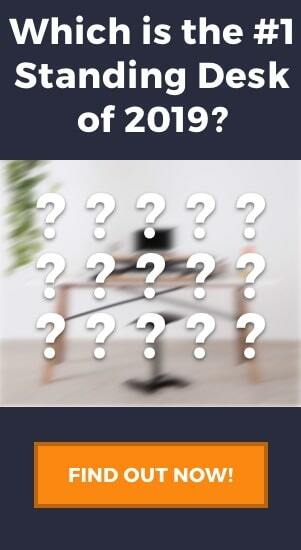 A huge part of my, and many people’s, lives is spent at the office, so while there are plenty of exercises, yoga classes, and stretches you can do to prevent injuries, if your office setup is causing you problems then you may be causing yourself long term damage. I firmly believe that a good ergonomic mouse and keyboard set-up will do wonders for your forearms, wrists, and hands and help prevent wrist injuries at the office. I must say, the HE Break comes beautifully packaged – everything is soundly tucked into the box and there were no worries of any type of damage happening during transit. The box itself is sturdy and thick, and the contents arrived in 100% perfect condition. The first thing that I really loved about the HE Mouse Break was the compatibility with my Mac. It took me all of 2 seconds, the amount of time to take it from the box and plug the USB cable in, to get started. Unfortunately, being a Mac user means I don’t get the full use of ALL of the Break’s features. The Break’s name actually comes from the fact that it has a small light to indicate when you should be taking a small break from your work. 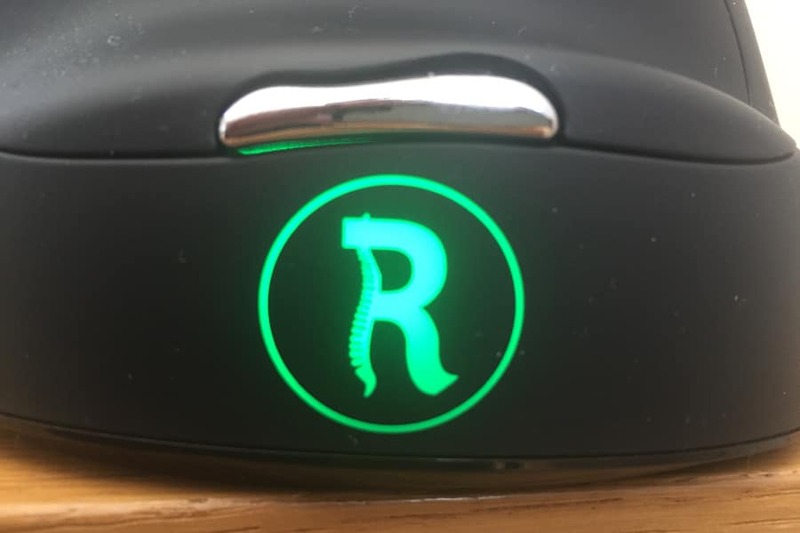 The small light on the inner side is set to change color between green, orange, and red depending on how long you have been using the mouse. The link that came on the card in the box is to software to download that sets the mouse to switch between these colors, but it seems that for now, this feature is only available for Windows users. The HE Break “traffic-light” is an interesting feature that is unfortunately not compatible with Mac. I think it is a cool feature and there are many of these sorts of timers, such as the ones you can download which tell you when to rest your eyes, which allow you to focus on work and not worry about when to take breaks. At the same time, not having access to this feature doesn’t change the fact that I can still get full ergonomic benefit from the design and build of the mouse, so if you are a Mac user like me I wouldn’t let it influence your decision-making too much. So, being a Mac user I haven’t managed to use this feature, but if you work on windows then you can! So the very first thing to note about the HE Break is that it is a right-handed, corded mouse. When you buy this mouse it comes with two options: either medium sized or large, and straight off the bat for me, this was a great feature. I’m quite tall and my hands are bigger than average, therefore using smaller products and “one-size-fits-all” mice can give me problems and are generally not so comfortable. When I grab the HE Break it fits my hand so much better and already it feels more comfortable than the basic vertical mouse I have been using recently. It doesn’t come in a wireless version, nor are there options for lefties, but if either of these options takes your fancy then you should take a look at the HE Sport (only wireless, both right and left handed options), or the HE Mouse (medium and large, wired or wireless, left and right handed). Straight away you can tell that this product is well built. It is not very heavy, but at the same time feels sturdy and doesn’t have that classic “plastic” feel that many mice can have. On top of this, I really like the finish of the mouse which feels almost like a soft rubbery texture – it is nice to touch and gives you a better grip than a smooth plastic finish. One small feature that I immediately loved was the small “lip” that sits beneath your hand. 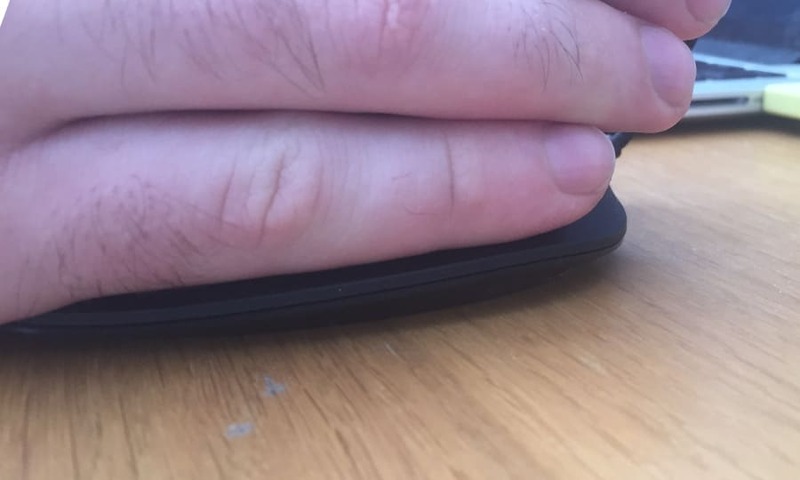 Vertical mice are great for ergonomic reasons of keeping your wrist in a neutral position, but what was happening to me when I used a different mouse was that the side of my hand would rest on the table. There is nothing ergonomically wrong with this but it makes it difficult to maneuver the mouse and it feels like you hand gets stuck against the table. By adding this small lip the side of my hand is off the table and the mouse can glide freely as I move it. As I said, it sounds small but it has dramatically changed the user-experience! You can see here how the lip lifts my fingers off the table surface, making the mouse easier to manoeuvre. One thing that makes an ergonomic mouse even better is the number of buttons you have at your disposal. The HE Break has the standard two button and a scroll wheel on the figer-side, with an additional mouse for adjusting the DPI. The DPI is essentially the measure of how sensitive your mouse is – and the Break offers 4 levels: 500, 1500, 2000, and 3000. By clicking this middle button you can scroll through the options to adjust the level of sensitivity. I personally like a higher DPI so I can move the cursor a large distance without moving the mouse far, reducing further strain on the hand and wrist. 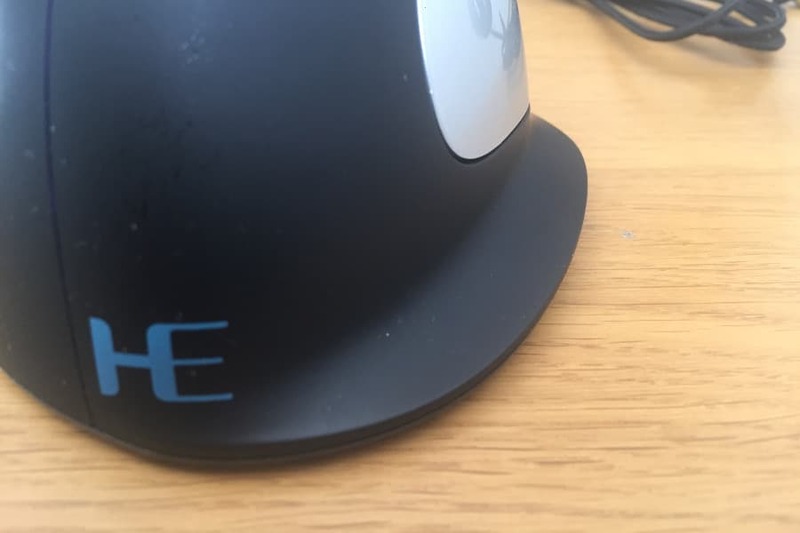 The HE Break also has two buttons on the thumb-side of the mouse. The buttons don’t come pre-programmed out of the box it seems – but I took the advice of the R-Go website and downloaded SteerMouse which allows you to program the function of these buttons. Additional thumb buttons can be programmed to add additional functionality. This program allows you to add a number of functionalities, so depending on what you need the mouse for you can set it up as you wish. The cable is really easy to keep tidy with the velcro strap. One thing I mentioned before was the fact that the HE Break only comes in a cabled version. I personally don’t mind cables, but there are some people who prefer a wireless mouse. As mentioned, the HE Sport or HE Mouse both have this option and are worth checking out. One thing I do like about the HE Break is the length of the cable. 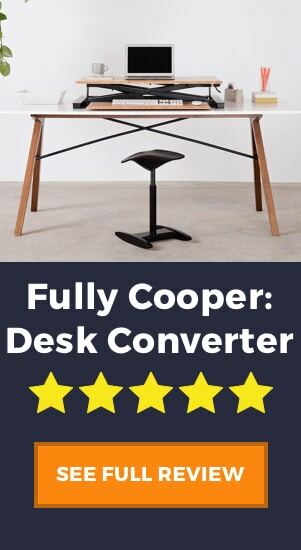 At 63″ (160 cm) in length, you can comfortably use the mouse even from a bit of a distance. It also comes with a small velcro strip which means that you can keep the cable neat and tidy when not using the full length of it. 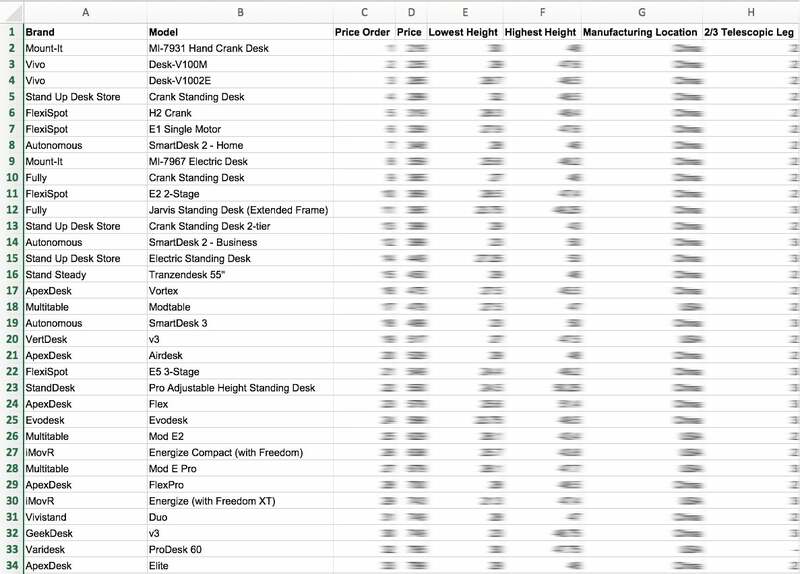 Although certainly not the cheapest mouse (it is possible to get an ergonomic mouse for only $20) – I really don’t think it is that expensive given the quality. Given the range of prices is generally between $20 to $120, the HE Break is on the more expensive side. However, a mouse is generally a product that you can but once and not have not worry about replacing for years – so buying a HE Break with high build-quality is definitely worth considering. 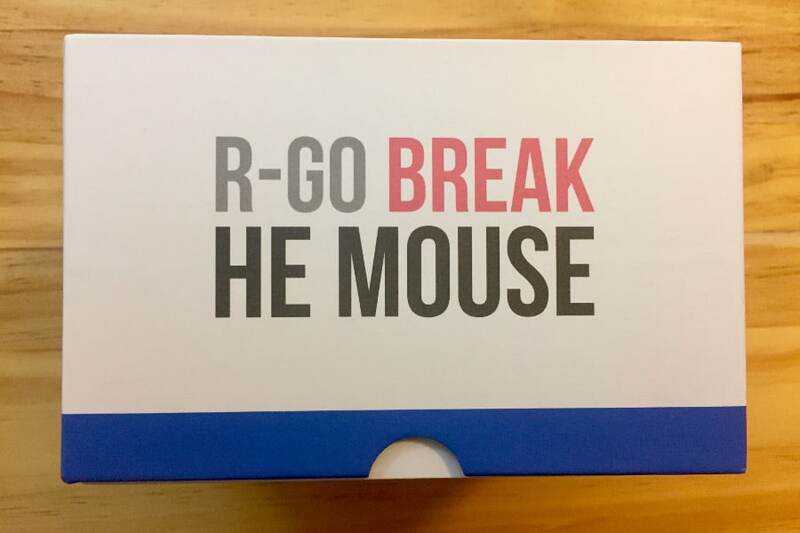 If you’re looking for a high-quality vertical mouse with additional buttons and strong build, then the R-Go Break is definitely a worthy choice. Sadly I didn’t get to use the feature which gives it its name (the Break) – the traffic light system which gives you an indication of when it is time to take a rest, but Windows users will be able to make the most of this. Small attention to detail features such as the small lip make the mouse a pleasure to use. On top of this, the different sizes for different hand shapes make this mouse really comfortable for someone like me that has slightly bigger hands. Also, I enjoyed being able to program the buttons for extra functionality. I’ve only ever had the use of two buttons before so having five was a luxury. I guess the most important question to answer in the end is: how does my wrist feel? I must admit, at first using a vertical mouse can feel a little bit strange. After so many years of using a standard mouse, making the transition may take a week to get used to. Now though, I much prefer using it. I love having my wrist in a neutral position which doesn’t pronate my forearm and put strain on my already damaged wrist, so for me after testing out the HE Break I’m definitely going to continue to use it.